It might seem odd to learn that downtown craft-beer bar Eternal Tap doesn’t have a single bottle of craft beer in it. But that’s how general manager Kevin Maguire likes it. Rather than a bottle cooler, Eternal Tap has a “can cabinet – a wooden bar-closet with dew-frosted glass panels, in which it stows the numerous types of canned beer for sale. It’s the first of its kind in downtown Orlando. Though many may associate canned beer with cheap beer, there’s no shortage of high-quality canned product available on the market these days. Tampa’s Cigar City Brewing, which was recently named one of the world’s top 5 craft breweries by RateBeer.com – began canning its products just months before Eternal Tap’s grand opening in December. Eternal Tap also carries cans of Abita, Shipyard, Ten Fidy, Dale’s Pale Ale and Magners Cider, as well as some traditional American lagers like Budweiser, Coors, Miller and Yuengling. Oskar Blues Brewery canned their first Dale’s Pale Ale in 2002, igniting a revolution in craft-beer dissemination on the West Coast. Glass bottles aren’t permitted inside Colorado’s gorgeous national parks, and the annoyance of empty bottles clinking together and wasting space in hikers’ rucksacks discouraged people from bringing craft beers onto Colorado’s nature trails. But Oskar Blues’ cans could be drunk, crushed and tossed into a backpack with no impact on the environment, lightening the drinker’s load. A decade later the trend swept eastward, with big players like Magic Hat in Vermont and Brooklyn Brewing canning their flagship beers like Magic Hat #9 and Brooklyn Lager, respectively. But it’s only been in the last year, with Cigar City coming aboard, that the movement’s gained traction in this region. “I had a guy in a bar argue me down one night about [canned beer], and I said ‘Well, how is beer better out of a bottle?’” asks Justin Beamon of Tampa’s Craft Beer Crew, which operates the first mobile canning line on the East Coast. Craft Beer Crew hauls a 25-foot box trailer full of seaming material (this is what seals a beer can shut), filling and labeling equipment to microbreweries. The equipment is too expensive for many small beer companies to permanently install on site, so Craft Brew brings the operation to them. They arrive at a brewery, set up the rig, can whichever products the brewery desires and leave behind a shipment of sealed barley goodness ready for distribution. 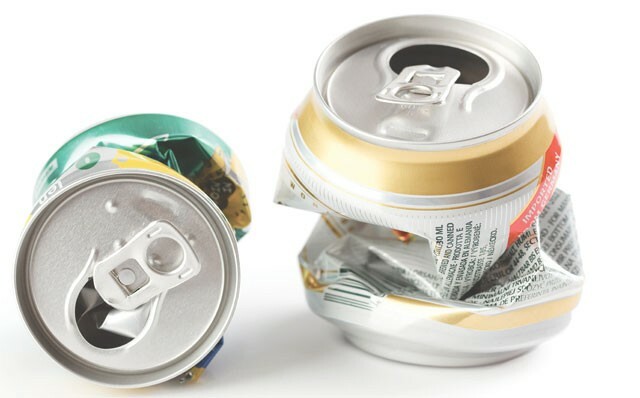 Maguire says there’s a perception that canned beer “skunks,” or goes bad, after being opened and sloshed around. But he says that aeration isn’t the only thing that causes that funky, wet-paper tasting beer. Exposure to ultraviolet light causes the hop and sulphur compounds in beer to deteriorate. Glass bottles allow light in, but cans don’t. No UV rays means less chance of skunked beer. “It’s like a draft directly into your glass,” Maguire says. As of this writing, Craft Beer Crew had canned a run of Green Room Brewing’s seasonal beers in Jacksonville and talked with Swamp Head Brewery in Gainesville about canning a flight of their Stump Knocker Pale Ale and Midnight Oil Stout. They’re all Florida brews that could land in Eternal Tap’s cabinet soon. Maguire says he hopes to eventually stock 102 unique canned beers.